“Christopher Robin” grows up in this new “Winnie the Pooh” feature. Not to be confused with 2017’s “Goodbye Christopher Robin,” Disney is known for producing solid live-action remakes that would bring magic to families who grew up watching animated features. This feature enhances your moment to see two main characters, Christopher Robin and Winnie the Pooh together as this film unfolds the mystery of childhood and adulthood. 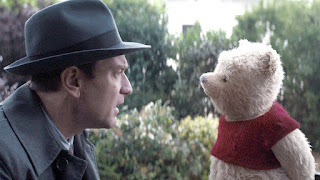 This film stars Ewan McGregor and Hayley Atwell while voice actors Brad Garrett, Toby Jones, Nick Mohammed, Peter Capaldi, Sophie Okonedo, Sara Sheen, and the returning voice artist Jim Cummings as Winnie the Pooh and Tigger appear in this feature. In this film, Christopher Robin has grown up and forgets everything that has happened with his times with Pooh and his friends. Pooh and the rest of the gang helps Christopher revived his childhood to bring his imagination back. This plot is very good. I love how the characters interact with the CGI Winnie the Pooh characters. They both gave stunning surprises as an advantage of a remake. The main cast of McGregor, Atwell, and Cummings did a remarkable job on their roles. The music in the background is outstanding while the CGI is well done. However, the main problem is there is no theme song of Winnie the Pooh included for the background. Additionally, small parts of the script-writing and the settings are chemically unbalanced as the story supposed to flow onto the right direction. Forster’s direction was somewhat difficult to blame as he gives children a terrible meaning of imagination. In regards, he has done a good job of keeping the flow for storytelling. Nevertheless, the film almost reach its level of delightfulness. This is the second Disney remake to both Ewan McGregor and Hayley Atwell as they featured in 2017’s “Beauty and the Beast” and 2015’s “Cinderella” respectively. Also, extra points on the legendary composer Richard M. Sherman for his cameo. Compared to 2011’s “Winnie the Pooh” feature, produced by Walt Disney Animation Studios, the characters of Winnie the Pooh brought some good viewpoints of childhood and imagination, which are main dynamics of the storyline. I gave this animated film a grade of A+ on a scale of A to F. What is a good childhood is that I met the voice actor Jim Cummings in town as he gave lots of laughs to children when performed a voice of Winnie the Pooh. As I aforementioned, “Christopher Robin” is an unforgettable family feature that will refresh your memories. On the outside, it’s a movie for grownups, but on the inside, it’s a movie for both grownups and children. I guarantee this film will bring your childhood and your imagination back to your senses. It will make you feel like a kid again and you always have your imagination to live on as you grow up. But if you don’t want to watch this, it’s better to watch the animated classics for your own amusement.